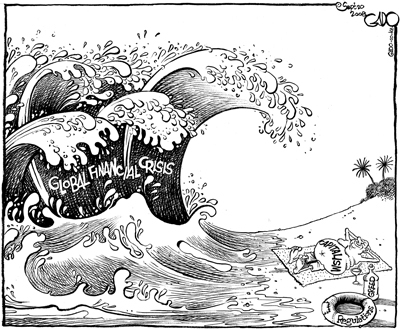 Today the press and TV are talking about the "flood" of liquidity that is almost drowning the world. However, until recently they were crying about the lack of liquidity that had given rise to the crisis in early 2000. Just five years ago, on September 15, 2008, the American merchant bank, Lehman Brothers failed and in the following weeks the aftershocks of a financial earthquake of gigantic proportions were multiplied. Back in July 2007 it had already started in real estate with the collapse of fictitious financial constructs. The government agencies, Fannie Mae and Freddie Mac were swept away one week before the Lehman case, which was allowed to fall into total collapse because it appeared that European banks and investors were the holders of the biggest liabilities. Instead U.S. authorities rushed to the rescue of other banks and savings banks (AIG, ITC, etc.) In total 1.765 billion dollars ... Not only the Fed but also the ECB followed and pumped in liquidity, imitated by the Bank of England and Japan. Today the ECB still performs refinancing operations at an interest rate of 0.5%. Thus five years have passed and everything looks more or less as before. The "nodal point" of the crisis (sold as such even if the reality is quite different) is tangled up with the famous derivatives games that led to so many financial acrobatics. In the U.S., the Dodd-Frank reform (Law of 2010) has been virtually stalled by the manoeuvres of the financial lobbies (especially with regard to the fantastic pay-outs to the top bank managers!). It's true that the major banks have increased their capital, but the relationship between the assets and the share capital of each bank (leverage ratio) is still a mystery and definitely not in a position to absorb losses which would thus be passed on to the "public". Basel 3 proposed a minimum capitalisation of 3%, but in reality it would require tens of billions of dollars that the U.S. banking giants have no intention of putting on the table. They take advantage of the fact that their failure would have destabilising consequences for everyone, and as banks are "too big to fail" are sure to get the public bailouts in the event of heavy losses. Meanwhile the Practical Packaging continues (or if you prefer, the "bagging up" like smelly sausages) of securities based on debt in the hands of others, while those who had toxic assets in their portfolio still have not sold them, thus avoiding acknowledgment of the losses. As is well known among the "experts", the value of derivatives is derived from fictitious rates, currencies, indexes, etc.. being contracts between parties: someone who buys and sells risk, covering themselves in turn with other appropriate instruments. The main risks come from changes in exchange rates, commodity prices, the values ​​of securities and calculation of the risk of default. The fall in the average rate of profit, a tendency which has been underway for some time with brief upturns which the proletariat has paid for dearly, has sparked the sorcery around the use of financial instruments which are as sophisticated as they are fraudulent. This is not only a zero-sum game, but causes chilling financial shocks. Terrifying sums of debt have carried over to today: according to the Bank for International Settlements (BIS) the notional amount[i] of outstanding derivatives (the vast majority of derivatives are on interest rates) would be equal to $632.7 trillions, amounting to over 9 times the GDP of the entire planet. More precisely: derivatives of $8.8 for every dollar of GDP! (source: World Economic Outlook / IMF, April 2013). In 2007 their value was $596,000 billion, that is, when they were officially considered as the cause of the crisis. In 2012, the cost of surrendering these contracts, at current market prices, was estimated to be about $20 trillion. The banks with the largest exposures are American, led by JP Morgan and followed by the omnipresent Goldman Sachs. The only choice left is to climb more and more recklessly, without a rope or metal spikes, the mountains of waste paper, bad debt, Treasury bonds, mortgages. These debts create waves of excess liquidity and sudden contractions, alternating with rising stock prices which then go into free fall. Money-capital cannot slow down, much less stop its insane movement. It must try to survive by breaking down any barriers that currently threaten and restrain both the development of the productive forces (the search for increased productivity of commodities in order to continue the accumulation of capital) and the expansion of artificial needs. But both backfire, because it requires less and less living labour to produce goods and thus unemployment spreads and the market is constantly faced with less solvent purchasers. The sound of the death knell spreads while black storm clouds are looming up on the horizon. [i] The notional value would be the underlying debt position of the derivative.